You all remember Sid Bream, don’t you? Well, probably not: he was a mediocre first baseman about 20 years ago who played for the Pittsburgh Pirates and the Atlanta Braves. He hasn’t been heard from in a long time, being quietly retired, but the Braves may be hosting the Pirates in an upcoming National League Division Playoff Series as the baseball post season gets underway, and they invited Bream to throw out the first pitch in Game #1 if that is the case—-Pittsburgh has to win a wildcard play-off game with Cincinnati first. 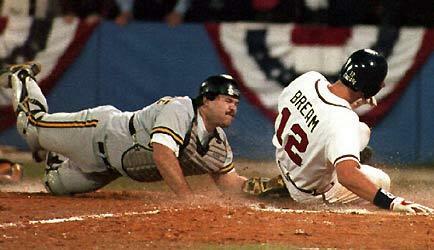 You see, the one thing in his career that Bream is remembered for, at least in Atlanta, is scoring the run that won the National League Championship Series over the Pirates in 1992, in a close play that also lives in Pirates’ fans nightmares. Throwing out the first pitch is fun: the team flies you in and pays for your hotel, gives you a prime ticket, and then announces your name as you trot on the field to cheers. If you have kept your arm in shape, you might even get off a throw to the catcher from the pitcher’s mound that doesn’t embarrass you, and that will acquire more cheers. from the packed stadium. 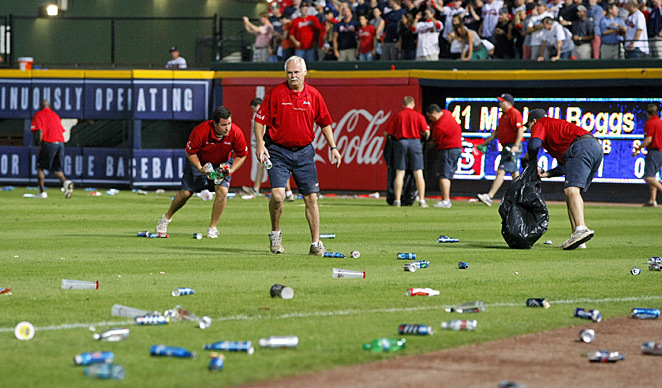 Wait…this is Atlanta, not Boston. OK, from the two-thirds filled stadium. Even then, what’s not to like? Oh, I think it’s fair to say that rubbing the Pirates’ faces in their last loss to the Braves in a postseason game was exactly what the Braves had in mind. This kind of voodoo has been a standard part of baseball gamesmanship for a long time: nobody believes that the Yankees had Bucky Dent throw out the first pitch when the Yankees had a crucial playoff game against Boston (which they lost) in 2004 “to commemorate those two teams getting back together in the postseason.” It’s psychological warfare, and more or less good-natured; there’s nothing wrong with it, and there would have been nothing wrong with Bream agreeing to play along. But Sid Bream is, it seems, loyal. He was a Pittsburgh Pirate for a long time, a Brave only for a couple of years, and he doesn’t feel like being part of one of his former teams’ effort to unsettle the other one, even though its’ no big deal, and even though his old team won’t hold it against him. It just would feel right to him. The Atlanta Braves lost the first ever National league Wild Card play-off game, 6-3, to the St. Louis Cardinals, thanks primarily to their own atrocious fielding (the Braves made three costly errors.) Nonetheless, many fans felt they “wuz robbed” because of a bizarre play in the 8th inning, when the Cardinals were rescued from a bases loaded, one out situation after the game’s left field umpire, Sam Holbrook, apparently feeling that he had to do something to justify being on the field (regular season games don’t have left field umpires), called the infield fly rule on a pop-up that landed safely in the outfield. The infield fly rule is designed to prevent sneaky double plays, and is called when an easy pop-up might be intentionally dropped by an infielder. Thus the ball is an out whether it is caught or not. There were three problems with the call. First, it was called very late in the play, after it was evident that the Cardinals fielders might not catch it. Second, given its placement, letting the ball drop to try to get a double play really wasn’t an option. And, third, as I noted, the ball landed in the outfield, which an infield fly is not supposed to do. The Braves argued the call, to no avail. Jack's last victim: a logo, perhaps? The city’s mayor has expressed concerns about the name, and good for him. This isn’t a manufactured political correctness complaint, based on the dubious logic that it demeans a group to honor it with an athletic team name. This is the opposite: a team name that honors a serial killer who disemboweled poor women in the slums of London in 1888. Misogyny isn’t cute or funny, and anyone who thinks that making Jack the Ripper a team symbol is anything but one more outrage perpetrated against his pathetic victims but gets indignant over the Atlanta Braves has his head on upside-down and backwards. “…Jack the Ripper did his work, like, 130 years ago. Murder is murder and it’s always awful, but at what point has enough time passed to where this kind of thing isn’t a problem? And yes, I note the mayor’s nod to ending violence against women, but does a reference to a 19th century British serial killer who is more often fictionalized today than dealt with in his brutal reality really undermine those laudable aims? Ugh. How many rationalizations are in this passage? Playground chants about Lizzie Borden (or the Black Plague, which is what “Ring around the rosey” is about) are not remotely comparable to naming a community’s baseball team after a serial killer. Playground refrains don’t become part of a community’s identity, and they don’t in any way bestow prestige on the dark subjects of their rhymes. Teams named after crusaders, warriors, braves and pirates don’t aspire to honor the deaths caused by these groups, any more than teams are named the Lions or Tigers because they have mauled people, or the Cardinals and Orioles are so named because the birds poop on our heads. There one reason, and only one, Jack the Ripper is famous. 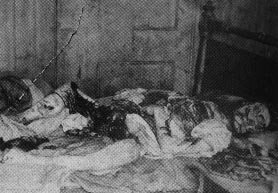 He slit the throats of desperate prostitutes and dissected them,: in the case of Mary Kelly, he minced his victim, leaving her internal organs on her night table. The London Ripper sent body parts of one victim to police, and taunted them. He didn’t possess a single admirable quality to justify a connection to a sports team, unless there are professional misogyny, mayhem or maniac leagues somewhere. And Craig’s argument that is an expiration date on the offensiveness of trivializing tragedy is the worst of all. Seriously, Craig? So Penn State can call its wrestling team “the Molesters” in 100 years or so? What he’s really endorsing is ignorance. Kids who chant about the bubonic plague don’t realize it, and neither do their parents. That a lot of people don’t know the truth behind all the fictional Jack the Ripper tales is an argument for enlightening them, not pretending that killing prostitutes is just fun and games. The mayor of London is right, Craig is wrong, and if there ever was an inappropriate and harmful team name, the London Rippers is it. In Game two of the 1991 World Series between the Minnesota Twins and the Altanta Braves, Brave outfielder Ron Gant singled and rounded the bag, drawing a throw to first base. He appeared to beat the throw to the bag, but the Twins’ jumbo first baseman, Kent Hrbek, wrapped his arm around Gant’s leg and lifted him off the base as he applied the tag. 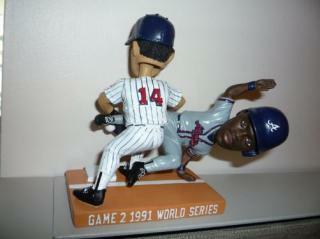 First base umpire Drew Coble managed to completely miss Hrbek’s illegal tactic, and called Gant out to end the inning. The Twins went on to win that game by one run, and in one of the closest Series of all time, also won the World Championship, 4 games to 3.